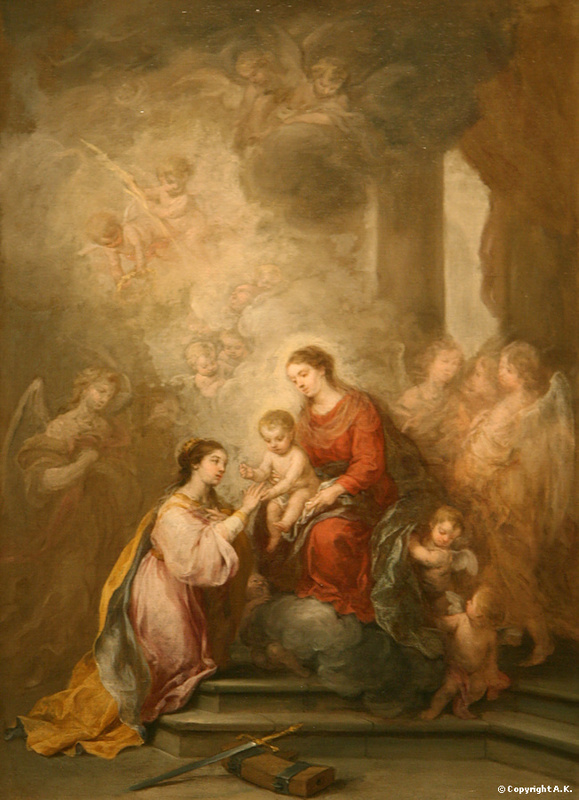 St. Catherine was born at Alexandria, of pagan parents. Living in the capital—the centre of Hellenistic knowledge—and possessed of an uncommon beauty and intellect, Catherine received a most splendid of educations, having studied the works of the finest philosophers and teachers of antiquity. Young men from the most worthy families of the empire sought the hand of the beautiful Catherine, but none of them was chosen. She declared to her parents that she would be agreeable to enter into marriage only with someone who surpassed her in illustriousness, wealth, comeliness, and wisdom. She, of course, was speaking of the God-child Jesus. She was gifted with great personal beauty, and possessed so extraordinary a mind, that she mastered all the sciences which, at that period, flourished in her native city. The only science of which she had no knowledge was that of eternal salvation; but this, too, she at last obtained in the following manner: It seemed to her, in her sleep, that the Queen of Heaven was standing before her in wondrous beauty, carrying her divine Son in her arms. But the latter, turning His face from her in displeasure, said that Catherine was ugly, because she had not been baptized. Catherine awoke, and, while thinking over her dream, she was inspired by Heaven to resolve to become a Christian. What he was unable to do, he thought others could do for him; therefore he summoned some of the most learned men into his presence, to answer Catherine's arguments, and persuade her to renounce the Christian faith. But the Almighty, Who, by a feeble maiden, could bring to naught the wisdom of the pagan sages, inspired St. Catherine with such eloquence, that she succeeded in convincing them of their error so completely, that they publicly renounced it, and proclaimed the Christian faith as the only true one. The emperor, enraged at so unexpected an issue, ordered these new confessors of Christ to be immediately executed. He then endeavored to win Catherine from her faith by flatteries and promises; and when he found that his words made no impression on the mind of the virgin, he began to threaten, and finally sent her away to be tortured. She was scourged so cruelly and so long, that her whole body was covered with wounds, from which the blood flowed in streams. 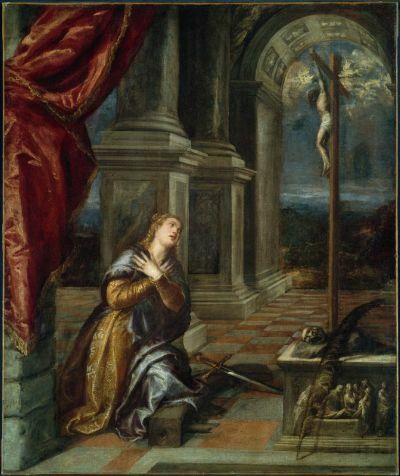 The spectators wept with pity; but Catherine, strengthened by God, stood with her eyes raised to heaven, without giving a sign of suffering or fear. After this cruel treatment she was dragged into a dungeon, and, by the command of the emperor, was left without food, in order that she might slowly pine away. But God sent an Angel, who healed her wounds and filled her heart with indescribable comfort. The Lord Himself appeared to her, encouraged her to fight bravely, and promised her the crown of everlasting glory. Some writers add, that the empress, having heard much of Catherine's wonderful learning, eloquence and fortitude, had deep compassion upon her, and secretly went at night with Porphyrius, the captain of the guard, to visit her in her dungeon. When she beheld Catherine's wounds healed, and the virgin resplendent with more than human beauty, she was speechless with surprise. Catherine made this miracle an occasion to speak to her of the omnipotence of the Most High, and of the falsity of the heathen gods. She spoke with such overwhelming eloquence, that the empress, as well as Porphyrius, promised to embrace Christianity. Maximin remained blind, and was thinking of new torments, when the empress came forward, reproached him with his barbarity towards a weak and innocent maiden, and boldly confessed that she herself recognized and worshipped no other god but the God of the Christians. The tyrant, hearing these words, lost all control over himself, and ordered the empress and Porphyrius to be immediately beheaded, and Catherine, as an enemy of the gods, to be taken to the public market-place and put to death by the sword. The fearless virgin went joyfully to the appointed place, exhorted all the people who had come to witness her death to abandon idolatry, prayed to God for their conversion, and then received the stroke that sent her soul to heaven. Ancient authors testify that milk flowed from the body of St. Catherine instead of blood, as had formerly happened at the death of St. Paul. Her body, they add, was miraculously carried by angels and buried on Mount Sinai, in Arabia. 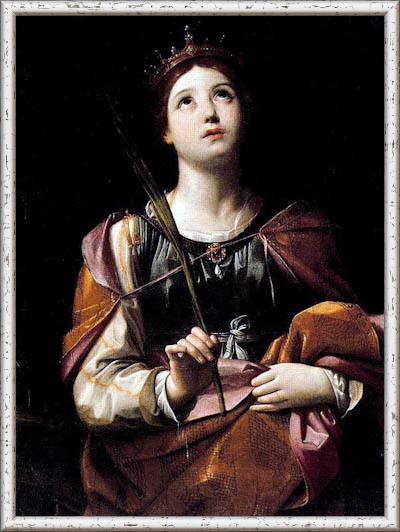 Because of the fabulous character of the account of her martyrdom and the lack of reliable documentation,the Roman Catholic Church in 1969 removed her feast day from the General Roman Calendar. But she continued to be commemorated in the Roman Martyrology on November 25.In 2002, her feast was restored to the General Roman Calendar as an optional memorial. In the Catholic Church she is traditionally revered as one of the Fourteen Holy Helpers. Hers was one of the heavenly voices heard by St. Joan of Arc.